He is the heartbeat of the band. Close to 100 La Porte Marching Band members follow his lead, moving across the field, putting all of their trust into two hands. Using those two hands to conduct is newly named drum major senior Zach Eason. “Zach is a strong musician, leader, and is well liked by the members of the marching band,” Mr. Stisher, band director, said. This season is Eason’s fifth year in the band. Before getting the drum major position, he played Sousaphone for four years. This was a difficult challenge for Eason because he no longer has the giant Sousaphone bell to hide behind. Everyone’s eyes are on him from the start of the show to the end. 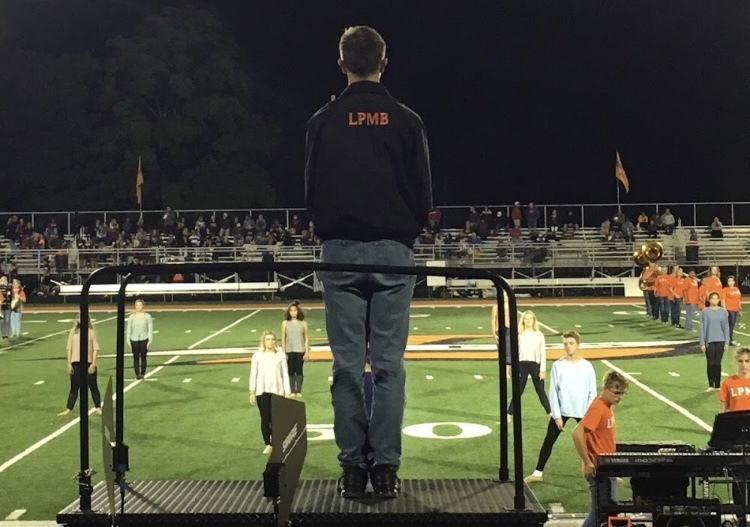 The La Porte High School Marching band has changed the lives of so many band kids, whether it have been through introducing them to a new hobby or creating a new friendship; Eason is no exception. “It’s a second family. I was kind of a loner in the eighth grade, but band introduced me to some of the best people I know. Besides, spend five summers doing something and eventually you’ll grow to like it,” Eason said. After spending the last five seasons in the La Porte Marching Band preparing for either the parade or the show, this next summer will be spent a little different by Eason. He plans on attending college but still isn’t sure where that will be. Outside of band, Eason enjoys playing the electric bass, but most of his off time is spent playing video games. He’s also very interested in film and takes pride in being a bookworm. “Zach is all around awesome. He’s, smart, kind, funny, tall, and wears great shirts,” Mrs. Cooper, English teacher, said. Between his high efforts in school, and his high spirits on the marching band field, Eason has always given it his all. There have been many drum majors for the La Porte Marching Band, but Eason is one that will never be forgotten.